Construction for York, PA’s Bell Socialization Services’ building is on schedule for a Fall 2013 completion. SAAarchitects helped to bring new life and use to the once vacant building by developing it into four apartments that will function as transitional housing. The potential occupants of the newly renovated building will be Bell Socialization Services’ residents who are transitioning back into living by their own means. Modifications to the building, previously occupied as Bells’ corporate offices (although, vacant since the 1980′s), included interior demolition and renovation, as well as exterior facade improvements. On August 2nd the Linden Lofts held an open house for residents of York. 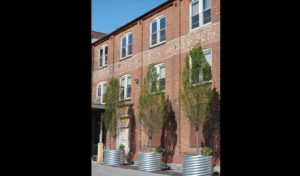 Locals were invited to come see the 29 new loft style residencies in the former Wagon and Gear Company. Take a look at the two articles below to see photos of the renovated building dated back to 1900 as well as how these new lofts are aiding to the city’s growth. Phase one of three for the Linden Lofts in York County is complete. SAA designed 29 loft style residencies in a former Wagon and Gear Company dated back to 1900. The Linden Lofts feature a large safe and secure courtyard allowing natural light into each residence. SAA integrated historic features such as preserving wood column covers, stained glass and large walk-in York Company Safes into each living space.